Fact check: Trump slams 'abolish ICE' Dems, says agency fights MS-13 gang. Is he right? While the movement to "abolish ICE" is spreading among Democrats, the president has come to the agency's defense. President Donald Trump spoke at length about Immigration and Customs Enforcement (ICE) on Thursday night, slamming Democrats for speaking out against the agency. "If you want to summarize the difference between Democrats and Republicans, just remember this: Democrats want to abolish ICE. Where did this come from? By the way, do you have any idea what ICE does?" While some Democrats have complained that ICE is a "deportation force" that should be abolished, Trump spoke at length about the brutality of the MS-13 gang, and the agency's work combating it. "These are people that go into a nest of MS-13," he said. "We want to abolish MS-13, they want to abolish ICE." 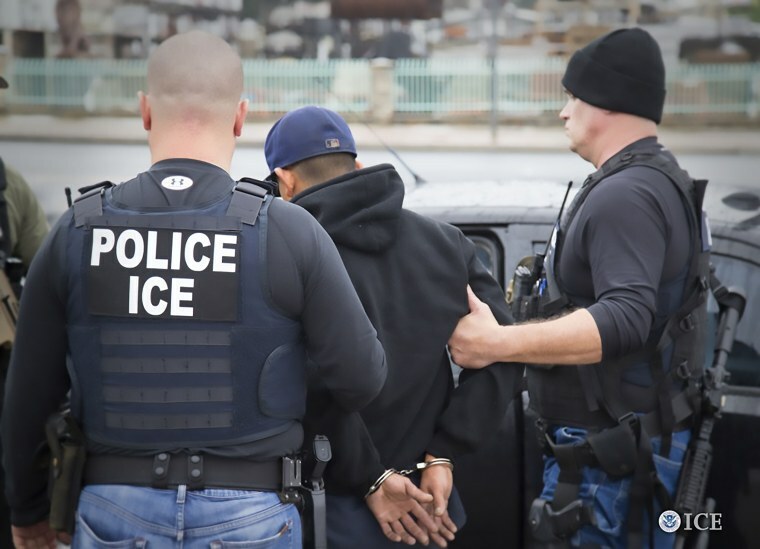 Let's take a look at the facts about ICE, and answer some of those questions. Fact check: Is ICE really a deportation force? What have Democrats actually said? Trump is correct that many progressive Democrats have voiced support for abolishing the 15-year-agency. "I don't think ICE today is working as intended," one of the most prominent "abolish ICE" lawmakers, potential 2020 contender Sen. Kirsten Gillibrand, D-N.Y., said recently. "I believe that it has become a deportation force." The position was popularized among activists on the left before being catapulted to the mainstream along with a handful of insurgent candidates like Alexandria Ocasio-Cortez, who defeated incumbent Rep. Joe Crowley, D-N.Y. in a Democratic primary with abolishing ICE as part of her platform. Sen. Elizabeth Warren, another potential 2020 contender, has expressed support for the position, too, while some other Democrats have sought to stake out more cautious territory. House Speaker Paul Ryan, R-Wis., called it the "craziest position I've ever seen." On Wednesday, the House approved a non-binding resolution supporting ICE and denouncing calls to abolish the nearly 20-year-old agency. A large portion of House Democrats voted "present," instead of voting for or against the proposal. A similar bill was introduced in the Senate,but Democrats blocked it. Immigration and Customs Enforcement apprehends, detains and deports undocumented immigrants, while also investigating transborder criminal activity, like gangs, human trafficking and smuggling. They do indeed work to combat transnational gangs like MS-13. While most apprehensions are done by Customs and Border Protection (CBP) — which operates along the border and at ports of entry, and does nearly all its apprehensions in those places — ICE apprehensions are often more visible because they're conducted inside the U.S., including at people's homes or workplaces. Those taken into custody by ICE are more likely to be established within their communities, or long-term residents. ICE also runs 126 detention centers nationwide as of press time and when detainees are ordered to be deported, the agency arranges for their transportation, sometimes by plane with ICE "Air Operations," which reportedly shackles passengers who are flown back to their home countries. Full Panel: Abolishing ICE new litmus test for Democrats? ICE does not police the border, nor was it the agency recently separating children from their families at the border — that was CBP — but parents referred for prosecution were held in ICE detention centers while the children were sent to the Department of Health and Human Services for care. With a budget of around $6 billion annually, ICE is staffed by 20,000 employees in more than 400 offices across the U.S. and 46 foreign countries, according to the agency. It was founded in 2003, in the wake of the Sept. 11 attacks, when the Immigration and Naturalization Services was split up and the Department of Homeland Security was created. Three new agencies were formed in the massive reorganization and housed under DHS: ICE, CBP, and Citizenship and Immigration Services (USCIS), which handles visas, green cards and naturalization. "None of the terrorists in 9/11 came from Mexico, but this national security and public safety mentality has come to affect ICE in all of its dealings with immigrants,” said Kevin Johnson, the dean at University of California, Davis, School of Law. The agency was smaller when it began, but set a goal of 100 percent removal of all undocumented immigrants in its 10-year plan, "Operation Endgame." It's a policy that largely tracks with what President Donald Trump has called for, although critics dispute the idea that deporting undocumented immigrants makes the U.S. safer. There is no evidence supporting the president's claim that immigrants are more dangerous than people born in the U.S. While Trump touts the agency's work with MS-13, arrests relating to the gang are — by the numbers — a small percentage of the agency's overall arrest tally. There were 796 arrests related to MS-13 in fiscal year 2017, an ICE graphic notes, and 143,470 immigration-related "enforcement and removal" arrests. There were 4022 other gang-related arrests, and more than 32,958 arrests done by the agency's criminal investigative arm that tackles drug rings, gangs, and crime organizations. The biggest numbers are the deportations. In fiscal year 2017, ICE deported 226,119 people, less than the previous year's 240,255 deportations, a downtick that is due largely to less people crossing the border illegally. But more of those deportations stemmed from ICE "enforcement and removal" arrests, the agency said in a press release crediting it to Trump's directives. While the Trump White House says those who are being deported are individuals with a criminal history, it has broadened the definition of what makes a criminal. The administration said 92 percent of those deported in fiscal year 2017 had a criminal history, but that includes those who have been charged — but not convicted — as well as those found with a past deportation order. Trump's immigration policies consider anyone who crosses the border illegally (a misdemeanor offense), who has been charged with a crime, or even an individual believed by authorities to have broken the law — even if they have not been charged with any crime — worth targeting. "You can't want to be part of this country and not respect its laws," former ICE acting director Thomas Homan told Fox News recently, in which he stressed a criminal history of the majority of deported immigrants. "ICE protects your communities and we're going to do it without apology." Has the agency changed under Trump? When Trump took office, he signed a series of executive orders on immigration; one called for ICE to hire 10,000 more agents to identify and deport more undocumented immigrants. Congress has so far declined to fund that plan. Trump also sought far more aggressive immigration enforcement than ICE had done in the past, eliminating the policy of prioritizing only dangerous criminals for deportation that President Barack Obama pushed in the final years of his administration. Under Trump, any undocumented immigrant who crossed the border illegally or used a fake Social Security number in order to a get a job can be targeted for deportation. Johnson said the president's rhetoric has encouraged agents to enforce the law "to the hilt." "We've seen a new enthusiasm and aggressiveness and a public persona that had not previously been seen," Johnson told NBC News. "Certainly under President Trump, it is the deportation arm of the U.S. government."